Download "LOS ANGELES CITY COLLEGE (LACC) ALTERNATE MEDIA PRODUCTION POLICY EQUAL ACCESS TO INSTRUCTIONAL AND COLLEGE WIDE INFORMATION"
1 04/28/2003 LOS ANGELES CITY COLLEGE (LACC) ALTERNATE MEDIA PRODUCTION POLICY EQUAL ACCESS TO INSTRUCTIONAL AND COLLEGE WIDE INFORMATION Federal and state regulations (see footer) require the provision of equal access to educational materials for all individuals with disabilities. Los Angeles City College has developed the following policy to demonstrate the college s commitment to equal access. 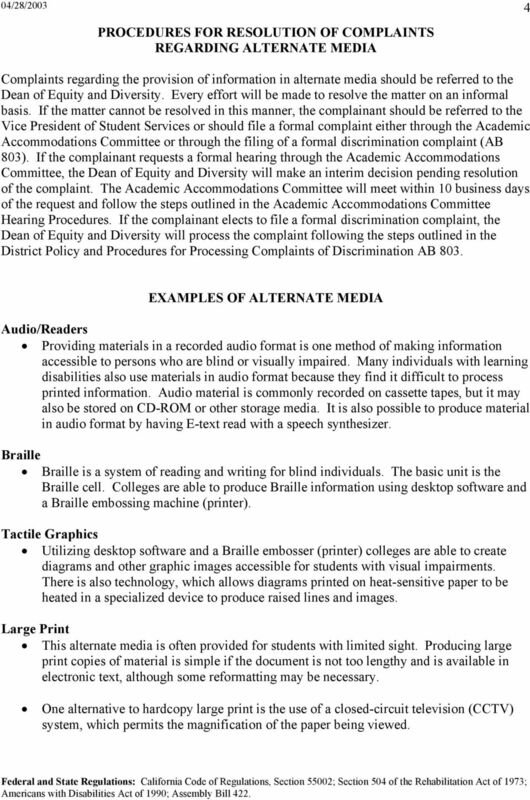 Information contained in this policy was developed in accordance with the California Community Colleges Guidelines for Producing Instructional and Other Printed Materials in Alternate Media for Persons with Disabilities (April 2000). 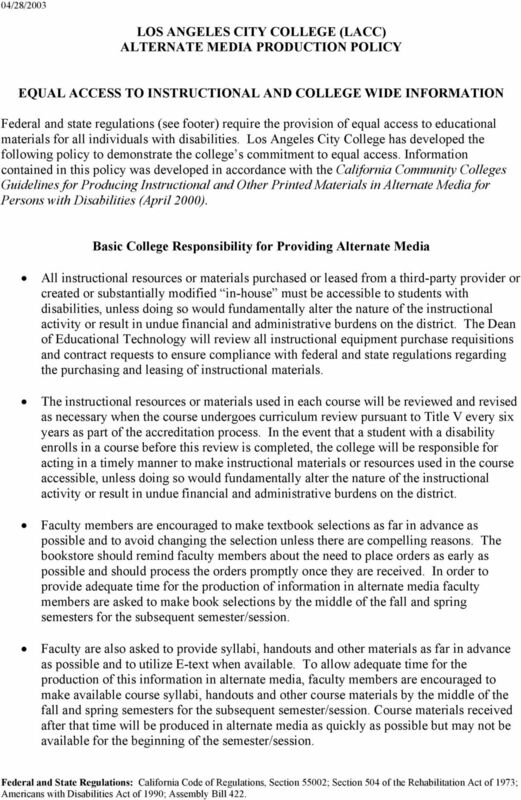 Basic College Responsibility for Providing Alternate Media All instructional resources or materials purchased or leased from a third-party provider or created or substantially modified in-house must be accessible to students with disabilities, unless doing so would fundamentally alter the nature of the instructional activity or result in undue financial and administrative burdens on the district. The Dean of Educational Technology will review all instructional equipment purchase requisitions and contract requests to ensure compliance with federal and state regulations regarding the purchasing and leasing of instructional materials. The instructional resources or materials used in each course will be reviewed and revised as necessary when the course undergoes curriculum review pursuant to Title V every six years as part of the accreditation process. In the event that a student with a disability enrolls in a course before this review is completed, the college will be responsible for acting in a timely manner to make instructional materials or resources used in the course accessible, unless doing so would fundamentally alter the nature of the instructional activity or result in undue financial and administrative burdens on the district. Faculty members are encouraged to make textbook selections as far in advance as possible and to avoid changing the selection unless there are compelling reasons. The bookstore should remind faculty members about the need to place orders as early as possible and should process the orders promptly once they are received. In order to provide adequate time for the production of information in alternate media faculty members are asked to make book selections by the middle of the fall and spring semesters for the subsequent semester/session. Faculty are also asked to provide syllabi, handouts and other materials as far in advance as possible and to utilize E-text when available. To allow adequate time for the production of this information in alternate media, faculty members are encouraged to make available course syllabi, handouts and other course materials by the middle of the fall and spring semesters for the subsequent semester/session. Course materials received after that time will be produced in alternate media as quickly as possible but may not be available for the beginning of the semester/session. 2 04/28/ VERIFICATION OF DISABLITY AND FUNCTIONAL LIMITATIONS Once a request for information in alternate media is received, the first step will be to determine whether the person making the request has a disability that requires an alternate media accommodation. Verification of disability is required for students to receive instructional information in alternate media and to determine the alternate media format appropriate for the functional limitation. Instructional material will be provided to the extent possible and reasonable in the alternate media format requested by the student. 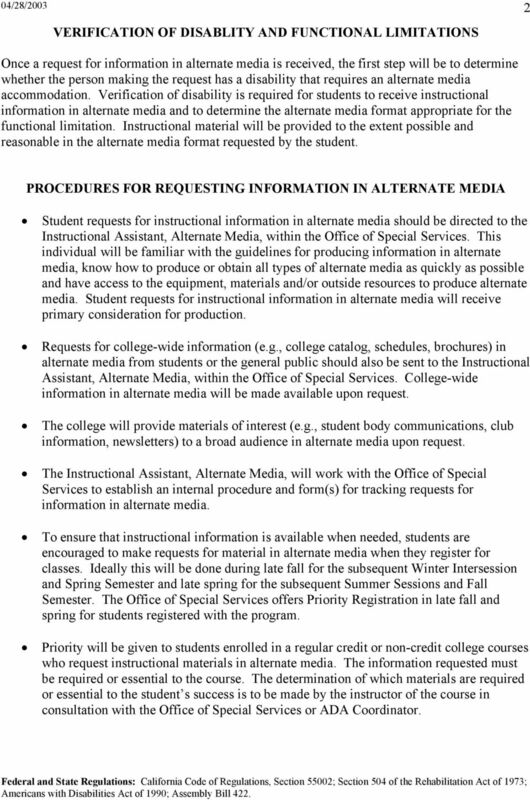 PROCEDURES FOR REQUESTING INFORMATION IN ALTERNATE MEDIA Student requests for instructional information in alternate media should be directed to the Instructional Assistant, Alternate Media, within the Office of Special Services. This individual will be familiar with the guidelines for producing information in alternate media, know how to produce or obtain all types of alternate media as quickly as possible and have access to the equipment, materials and/or outside resources to produce alternate media. Student requests for instructional information in alternate media will receive primary consideration for production. Requests for college-wide information (e.g., college catalog, schedules, brochures) in alternate media from students or the general public should also be sent to the Instructional Assistant, Alternate Media, within the Office of Special Services. College-wide information in alternate media will be made available upon request. The college will provide materials of interest (e.g., student body communications, club information, newsletters) to a broad audience in alternate media upon request. The Instructional Assistant, Alternate Media, will work with the Office of Special Services to establish an internal procedure and form(s) for tracking requests for information in alternate media. To ensure that instructional information is available when needed, students are encouraged to make requests for material in alternate media when they register for classes. Ideally this will be done during late fall for the subsequent Winter Intersession and Spring Semester and late spring for the subsequent Summer Sessions and Fall Semester. The Office of Special Services offers Priority Registration in late fall and spring for students registered with the program. Priority will be given to students enrolled in a regular credit or non-credit college courses who request instructional materials in alternate media. The information requested must be required or essential to the course. The determination of which materials are required or essential to the student s success is to be made by the instructor of the course in consultation with the Office of Special Services or ADA Coordinator. 3 04/28/ Students who request information in E-text must show proof of textbook purchase prior to receiving the information in alternate media. Students who request/require textbook scanning must provide a copy of the textbook. The scanning of textbooks as a means of providing instructional information in alternate media will necessitate the removal of the bookbinding. The book will be rebound with a spiral binding and returned to the student once it has been converted to alternate media. Students who request information in an alternate format (such as audio, large print, Braille, or electronic text), through a contract provider or through an institutional membership (such as Recording for the Blind and Dyslexic) must sign an agreement stating that they will not share, copy or sell the material, and they will not allow anyone else to do so. Students must also return the information to the Office of Special Services at the end of the semester for which the information was requested. Student requests for instructional information in alternate media will be processed as quickly as possible based upon the type of alternate media requested and the amount of information needing to be converted to an alternate text format. Delays in the selection, ordering and receipt of textbooks can have an impact on how quickly textbooks can be provided in alternate text formats; however, the college will do everything possible to ensure that students are provided with the information as quickly as possible. 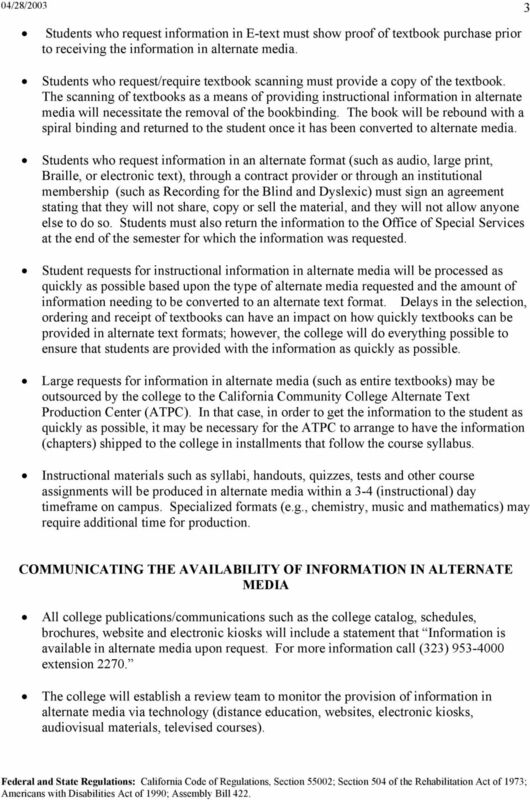 Large requests for information in alternate media (such as entire textbooks) may be outsourced by the college to the California Community College Alternate Text Production Center (ATPC). In that case, in order to get the information to the student as quickly as possible, it may be necessary for the ATPC to arrange to have the information (chapters) shipped to the college in installments that follow the course syllabus. Instructional materials such as syllabi, handouts, quizzes, tests and other course assignments will be produced in alternate media within a 3-4 (instructional) day timeframe on campus. Specialized formats (e.g., chemistry, music and mathematics) may require additional time for production. COMMUNICATING THE AVAILABILITY OF INFORMATION IN ALTERNATE MEDIA All college publications/communications such as the college catalog, schedules, brochures, website and electronic kiosks will include a statement that Information is available in alternate media upon request. For more information call (323) extension The college will establish a review team to monitor the provision of information in alternate media via technology (distance education, websites, electronic kiosks, audiovisual materials, televised courses). 4 04/28/ PROCEDURES FOR RESOLUTION OF COMPLAINTS REGARDING ALTERNATE MEDIA Complaints regarding the provision of information in alternate media should be referred to the Dean of Equity and Diversity. Every effort will be made to resolve the matter on an informal basis. If the matter cannot be resolved in this manner, the complainant should be referred to the Vice President of Student Services or should file a formal complaint either through the Academic Accommodations Committee or through the filing of a formal discrimination complaint (AB 803). If the complainant requests a formal hearing through the Academic Accommodations Committee, the Dean of Equity and Diversity will make an interim decision pending resolution of the complaint. The Academic Accommodations Committee will meet within 10 business days of the request and follow the steps outlined in the Academic Accommodations Committee Hearing Procedures. If the complainant elects to file a formal discrimination complaint, the Dean of Equity and Diversity will process the complaint following the steps outlined in the District Policy and Procedures for Processing Complaints of Discrimination AB 803. EXAMPLES OF ALTERNATE MEDIA Audio/Readers Providing materials in a recorded audio format is one method of making information accessible to persons who are blind or visually impaired. Many individuals with learning disabilities also use materials in audio format because they find it difficult to process printed information. Audio material is commonly recorded on cassette tapes, but it may also be stored on CD-ROM or other storage media. It is also possible to produce material in audio format by having E-text read with a speech synthesizer. Braille Braille is a system of reading and writing for blind individuals. The basic unit is the Braille cell. Colleges are able to produce Braille information using desktop software and a Braille embossing machine (printer). Tactile Graphics Utilizing desktop software and a Braille embosser (printer) colleges are able to create diagrams and other graphic images accessible for students with visual impairments. There is also technology, which allows diagrams printed on heat-sensitive paper to be heated in a specialized device to produce raised lines and images. Large Print This alternate media is often provided for students with limited sight. Producing large print copies of material is simple if the document is not too lengthy and is available in electronic text, although some reformatting may be necessary. One alternative to hardcopy large print is the use of a closed-circuit television (CCTV) system, which permits the magnification of the paper being viewed. 5 04/28/ Electronic Text E-text has emerged as a convenient and popular method of providing access for those individuals who cannot use standard printed materials. Partially sighted individuals can use E-text by taking advantage of built-in options within many standard software applications (to adjust font size) or through the use of specialized screen magnification software. E-text can also be used with screen reading software to output the text to a speech synthesizer or refreshable Braille display. The main advantage of E-text is that it can be easily stored, can be searched and indexed, and can be converted to large print or hard copy Braille through use of a translation program.